Ok so usually I like to eat the seasons and all that, but sometimes you you just gotta give into your food cravings, you know? You can take away my healthy food blogger card so long as I can keep this cauliflower tabbouleh to myself! So let’s pretend for a moment that we’re not in the dead of winter here and tomatoes are still very much in season….as are cucumbers! Cool? Maybe I’m just longing for the summer over here. With the exception of a couple of hours last Friday it’s been grey for a solid week. I wish I were exaggerating. I wouldn’t mind the weather if there was at least snow. Snow is at least pretty. It also reflects light back up so things don’t look quite so bleak outside. I just feel like I’m in an episode of House of Cards where everything looks really grey & dark. It’s driving me crazy! *Side note* I accidentally wrote House of Carbs at first. Cauliflower tabbouleh aside…that also feels very true. So yes. Think warm thoughts! After I made this ginger & turmeric hummus last week – I just had to make tabbouleh to go along with it. It felt wrong to be eating hummus and pita bread without stuffing the pita with tabbouleh as well. The only food (that I can think of) that I actually remember trying for the first time is tabbouleh. It has such a strong, distinctive smell. I was immediately taken back to my younger, smaller self sitting at the kitchen table at dinner trying to figure out what all the green stuff was. As it turns out, they were herbs! Lots and lots of herbs. 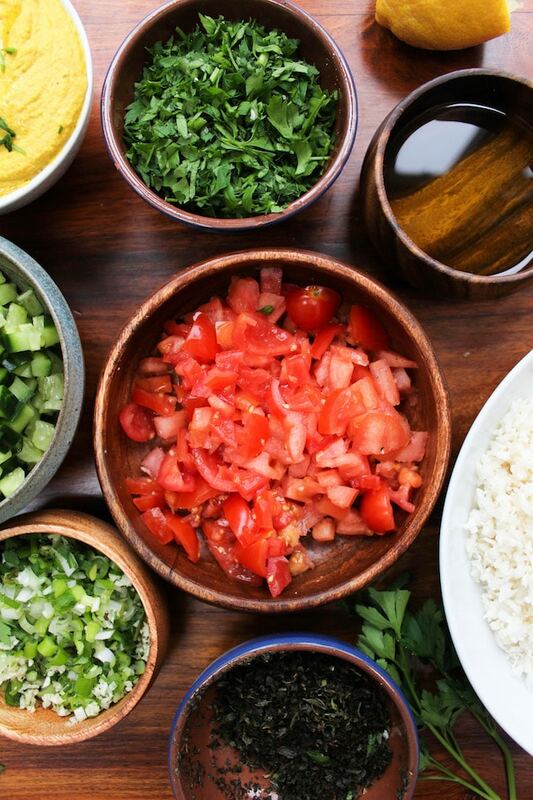 The key to any good tabbouleh is definitely the herbs. Fresh is a must here. Use mint and flat leafed parsley, diced up into tiny little pieces. The smaller it’s chopped, the easier it distributes throughout the salad and the more flavor you get in every bite. The same goes for the veggies. Traditional tabbouleh contains bulgur wheat which is a definite no-go in our house. Instead, we’re using grated up cauliflower because that’s how we do things here. You could grate the cauliflower up in a food processor or blender to speed things up a bit. Personally I find the extra five minutes of grating is preferable to cleaning blades on a blender, but to each their own. After everything is grated and chopped to standard it’s simply a matter of tossing it all together and dressing it in a little lemon juice & olive oil. Season with salt and pepper and serve. There’s so much bright and punchy flavors – it’s great any time of year! 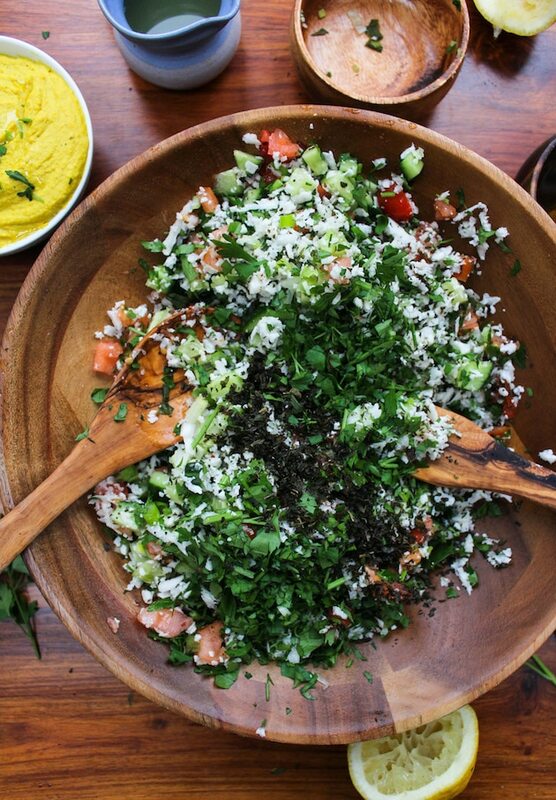 Don’t forget to #asaucykitchen on instagram if you make this cauliflower tabbouleh. We love seeing what you make! You can also post your pictures to our facebook page! Using a box grater to grate the cauliflower into grain sized pieces. Place the grated cauliflower in a large bowl. Mix together the spring onions, parsley, mint, garlic, tomatoes, and cucumber with the cauliflower. Toss to combine. Drizzle the lemon juice and olive oil over the top and sprinkle over the salt and red pepper flakes. Toss again until mixed well and serve immediately. Store up to one day in an air tight container. Why only one day in the fridge? It would have been great but I used sage instead of mint. In my defense I will say that I didn’t have my glasses on and the bags of herbs weren’t marked. I am going to make it again tomorrow. Thank you for the recipe! Oh no! I recently did pretty much the same thing but accidentally used parsley in place of cilantro – the parsley did not vibe well with the rest of my dish 😀 Hope you enjoy it more next time! 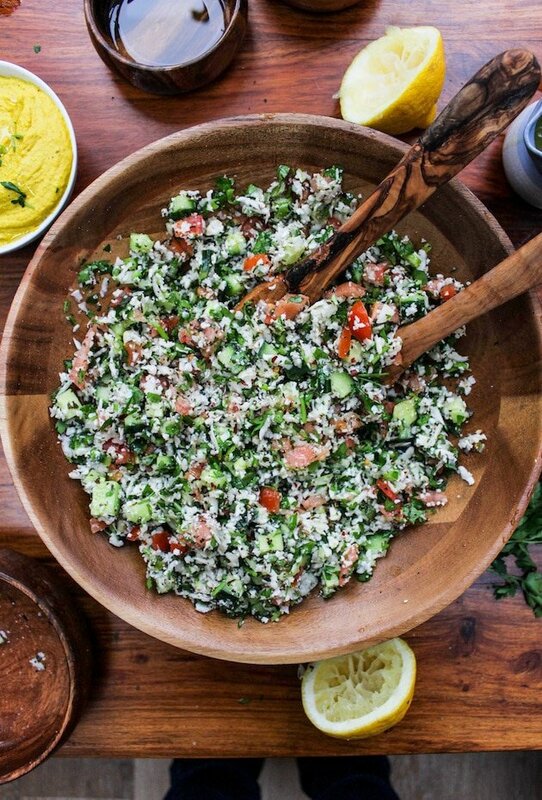 Loving this fresh spin on tabbouleh Sarah!